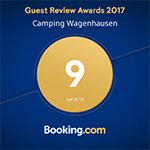 The Wagenhausen campsite began in 1959 as a small site for tents, right beside the Rhine. 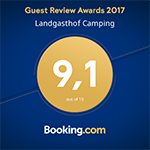 Founder and owner Adolf Näf is now regarded as one of the pioneers of camping in Switzerland. In 1973, the Swiss historian and journalist Niklaus Meienberg dedicated a multipage Report (Link) to Camping Wagenhausen which became part of a book called "Reports from Switzerland". The campsite has been owned by the Müller family since 1985. Today it is run by owner Harry Müller. The campsite is continuously being modernised and enlarged. It now covers no less than 4.5 hectares. It is a popular spot with both holidaymakers and locals, right beside the Rhine and not far from Lake Constance. The Landgasthof was built in 1989. The merger of the hotel and restaurant business with the campsite in 2012, and the modernisation of the whole site, were based on detailed business analysis. In the light of that, the eastern toilet and shower block was replaced by modern, more environmentally-friendly facilities, and the mini-golf course and the adjacent kiosk were entirely refurbished, landscaped and brought up-to-date. As of January 1st, 2018, the business was converted into a public limited company.